TheSlayer's Market Thoughts: Investing: Where Do I Start? I am going to post some articles from time to time on the basics of investing. This series will offer very general thoughts about how someone completely new to investing might consider approaching it, from the very first step to a method for choosing stocks. It is a starting point for discussion. So, this series is not intended to be the "last word" on anything. Instead, it will set forth my own thoughts on investing and offer practical strategies that I have used and some which I wish I had used. Let us assume that you have never had a brokerage account or held any kind of security. You do know some people who own stocks, though, and the idea is interesting because you have some free cash saved up and would like to get some return on it rather than have it just sit idle in the bank. Everything depends on personal circumstances. For most people, though, investing is a good idea as long as you stick with it and exercise some prudence. The figures speak for themselves. Stocks provide better returns than other investments such as bonds, and they sure beat getting no return in a checking account. The S&P 500 has returned over 7% per year at a minimum when held over ten-year periods, and more than that when calculated in different ways. The drawback to investing your money in the market is that you might suffer losses. This is the part that causes many people to vow never to invest in anything related to the market, and it is perfectly understandable. We have all heard horror stories about people, sometimes family or friends, who lost money in the stock market. However, you minimize that risk if you commit to holding your positions for years and not days or months. 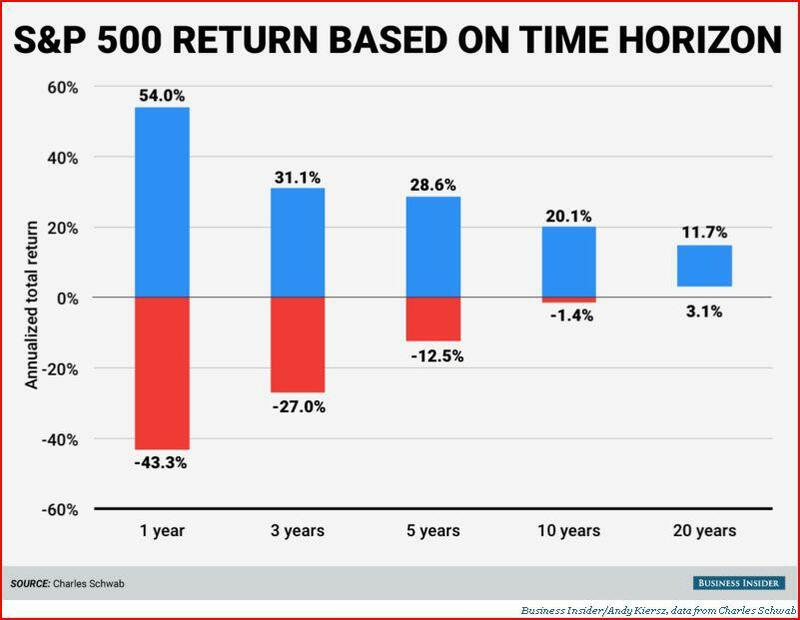 As the chart shows, the longer that you hold the basket of stocks in the S&P 500 Index, the more likely you are to achieve positive returns. The likelihood of suffering a loss dwindles into insignificance over the course of a full decade. There are many caveats to this. If you hold individual stocks rather than an index fund, then all bets are off and anything could happen. If you are just starting out, an index fund is a good place to get some low-risk experience with minimal long-term risk. 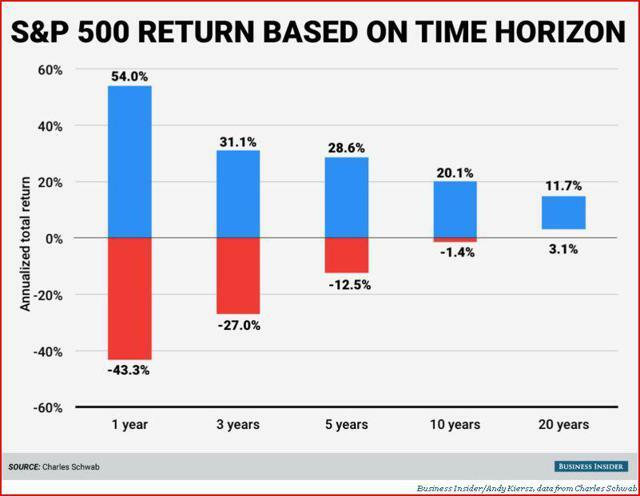 As a general matter, my conclusion is that you should would be better off investing in the stock market as long as you have a sufficient time horizon of five years or more, and also choose the right types of investments. Should I Start Investing by Opening a Brokerage Account? For most people, my answer to this is a definite "No." In my opinion, for most people, beginning your investing career by opening a brokerage account is a terrible idea. As I pointed out above, investing is a good idea if you have the proper time horizon, patience and are judicious about your investments. The best way to start investing depends upon your situation. I personally started out at a very young age with a passbook savings account. Yes, that was back in the day in a world that is long gone. You won't find those any more, but it was a great experience to go to the bank and deposit $5 or $10 into my savings account every so often and see the little typewritten entry in the book. Just getting used to saving money and watching my account balance rise absolutely gave me a life-long love of the value of investing. You can still do something similar today by setting up a money market account at a local bank. Many people who are new to investing are just starting out in the work world, have a new job, and want to do something with the cash flowing in. For those people, my view is that the place to start is through the retirement plan offered by your employer. That is what I did, and, looking back, it was a good strategy even though it was right before the market "crash" of 1987 and I quickly lost money. If your employer offers a 401(k) plan, that would be my first choice. Dump as much of your income into the company plan as you feel prudent. Even if you don't expect the job to last very long, you should be able to take the money with you later. Be sure to take full advantage of any corporate match of your contributions as much as you can, most major companies will match up to a certain level. If your employer doesn't offer any retirement plan, my suggestion again is to forget about opening a brokerage account. Instead, I would open an IRA at a local bank. You will get a tax break, and your income will accumulate without your having to pay taxes on it until you withdraw the funds some day. The sooner you can start up a Roth IRA, which allows your funds to accumulate tax-free but which does not give you a tax break up front, the better. A Roth IRA is a huge advantage to savers who have a long time horizon. Once you pay the initial tax, you should never (under current law) have to pay any taxes on that money ever again. It's a nice insurance policy against changes in the tax law. Roth IRAs are a topic unto themselves, though, and I don't want to get ahead of matters. The point is, avoid the whole brokerage account idea and stay local with some flavor of IRA. These days, banks will offer you enough choices in an IRA to get you started in investing. Your first investment should not be any individual stock, particularly not your employer's stock even if the company offers you a discount. Just pick the broadest index fund that you can, preferably one that follows the S&P 500 or similar large index. If all they offer is certificates of deposit, choose one with a short maturity date. Just get started, don't try to finance that beach house on Tahiti just yet. The bottom line is that, for your first investment, you should either do it through your employer or keep it local. If you can't invest through a good employer retirement plan, an IRA that you set up locally is an excellent place to start. Why Should I Not Open A Brokerage Account? I am a big fan of trading individual stocks, as I often discuss in my series of articles on my Generation Portfolio. So, it may sound a bit odd for me to suggest that you not open a brokerage account as your first step in investing. First, you need to get your feet wet. The stock market is an intimidating place, and the idea is for you as a new investor to remain within your comfort zone. Get used to investing and the ebb and flow of the stock market without trying to figure it all out at once. Read the news, follow the averages, notice what people say causes the market to rise and fall. It has distinct rhythms which you can't predict, but which recur over and over. Starting out as I proposed above will start giving you the biggest advantage - perhaps the only one - you will ever have as an investor: experience. Second, you are just setting yourself up for failure if you start trading stocks without having years - yes years - of experience closely watching the market. I opened my first brokerage account several years after my first investments through my employer's retirement accounts, and even that was too soon in my opinion. There is a very steep learning curve associated with trading stocks. The more you can reduce the losses associated with moving along that curve, the better off you will be. Third, having a brokerage account offers too many temptations and possibilities for poor choices which result from your inexperience. There are many great salespeople in the investing world, and every financial channel has them on every day telling you how wonderful their stocks or products are. There's no reason to give matches to a child, and there is no reason for a new investor to have the weapon of self-destruction that a brokerage account can become. Fourth, brokerage accounts play to your ego in the worst possible way. We all consider ourselves knowledgeable, with special insight about this, that or the other thing. Perhaps you've excelled in school, or at work, or with friends or family or a hobby or whatever it is. That is unlikely to transfer over to investing decisions. The market can become a very humbling place. Don't invest through a brokerage account until you are absolutely, positively certain that you are ready. You aren't ready unless you have been watching the market and economic developments for years. Fifth, the competition in the stock market is unlike anything else you are likely to experience. In baseball, they have the rookie leagues, the high minor leagues, and then the Major Leagues. There is a place for people to work out their strategies and skills. In the stock market, there is only the major leagues. You have no training leagues, except the ones I've discussed above. Immediately, on your first day of trading, you are facing people who have been doing it longer than you have been alive. Experience is the most important skill you will have as a trader, and it is just asking for trouble to start trading until you develop some. This is Part I of a projected series on basic investing topics. No individual article is intended to cover the entire realm of investing. However, my hope is that, in the aggregate (once I have written them), they will provide a useful introduction to people who are completely new to investing and want a place to think about it and discuss their ideas or questions with others. My conclusions in this article are that: the stock market is a good place to invest if you have the proper time horizon and adopt the proper strategy to begin with; that you should begin investing either through your employer or by opening up a local retirement account; and that you should avoid opening up a brokerage account until you are truly ready. These rules should keep you out of trouble until you are ready for the next steps, which I will get to in future articles.